Cliff Willmeng is an organizer with East Boulder County United, which is a member of Frack Free Colorado. One of the driving forces behind Colorado’s anti-fracking movement also happens to have quite the arrest record. Cliff Willmeng has been charged with disorderly conduct, resisting arrest, obstruction of police, harassment, and plead guilty to trespassing. His arrest record goes all the way back to the 1990s with arrests as recent as August 2012. Willmeng was behind the ballot initiative to ban fracking in Lafayette and has taken an incredibly aggressive stance against the oil and gas industry. 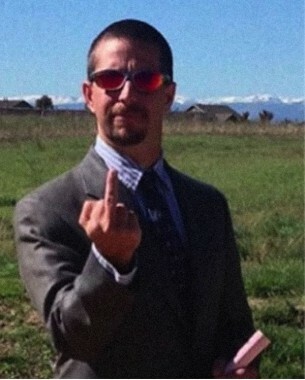 He even went so far as to post a photo of himself on Facebook giving the middle finger to an imaginary oil executive. Is this the type of extreme activist Coloradans should rely on for sound scientific advice?